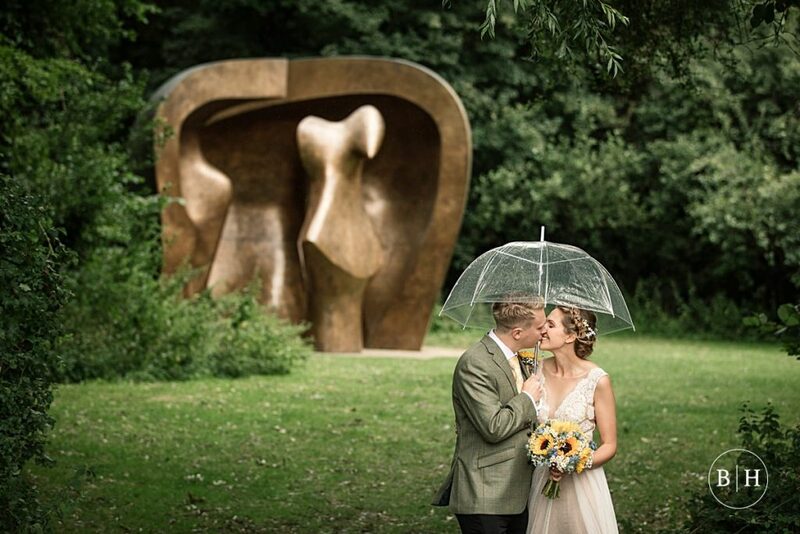 Top tips for a rainy wedding day - What if it rains on my wedding day? For many brides and grooms, planning a wedding brings out the inner event planner or organisation guru that we never new existed! Suddenly you’re planning all the details, big and small, that will make your day your own, and absolutely perfect in it’s own way. Unfortunately there’s one thing that we can’t plan for, and that is the great British weather! The likelihood of getting sun or rain on your wedding day obviously depends to a great extent on where in the UK you plan on tying the knot. Statistically, according to the Met Office, the wettest parts of the UK with the highest annual rainfall are the west of Scotland, the Lake District and Wales. But sadly there’s no way of being certain of the weather will do on any given day anywhere in the UK! From a photography point of view, a gorgeous, bright sunny day without a cloud in the sky isn’t actually as ideal as it sounds. In the middle of the day between 11am and 2pm, the sun is very high in the sky, and it’s harder to find nice, flattering open shade for your portraits and group photos. As a photographer, I’m more limited in where I can stand you for these photos (we want to avoid squinty faces!). If there’s a bit of cloud cover, it’s a lot more flexible and the light is a lot more even and flattering. So if the forecast doesn’t say bright sunshine all day, don’t panic! 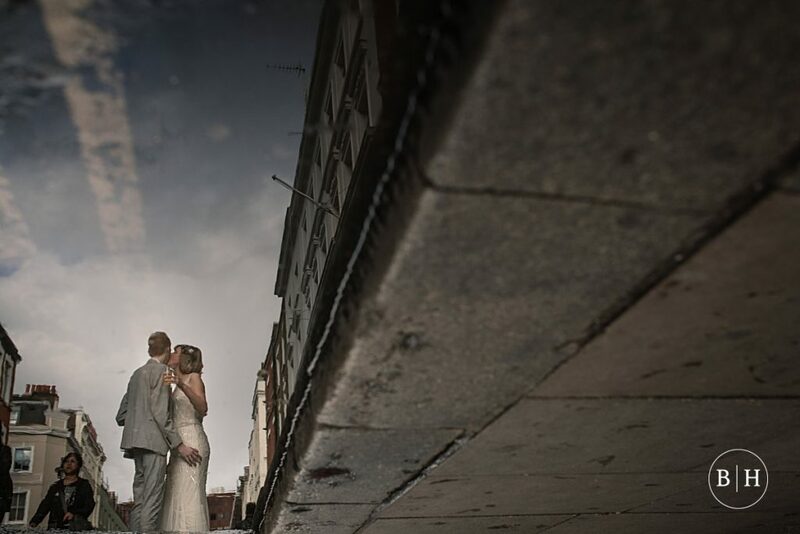 The best thing to do when planning your wedding, is to consider what you might do should the heavens open. Having a contingency plan in mind will keep you relaxed in the run up to the day itself. 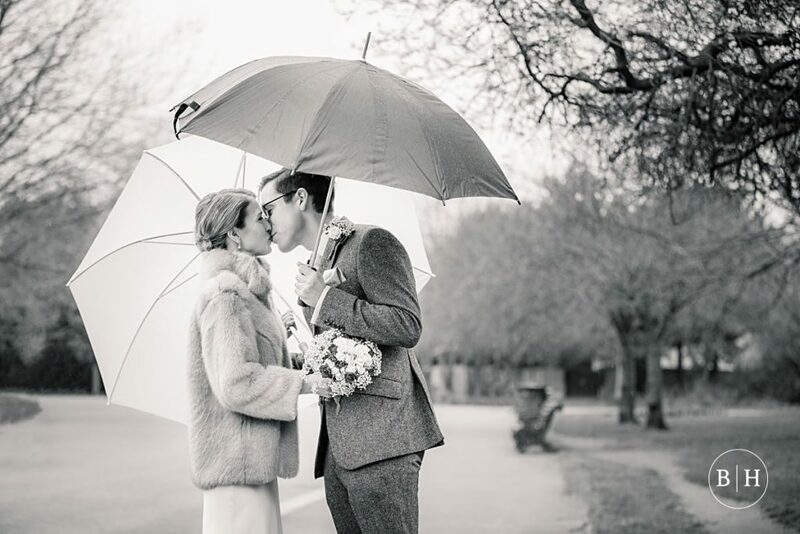 Here are some top tips for a rainy wedding day that might help! 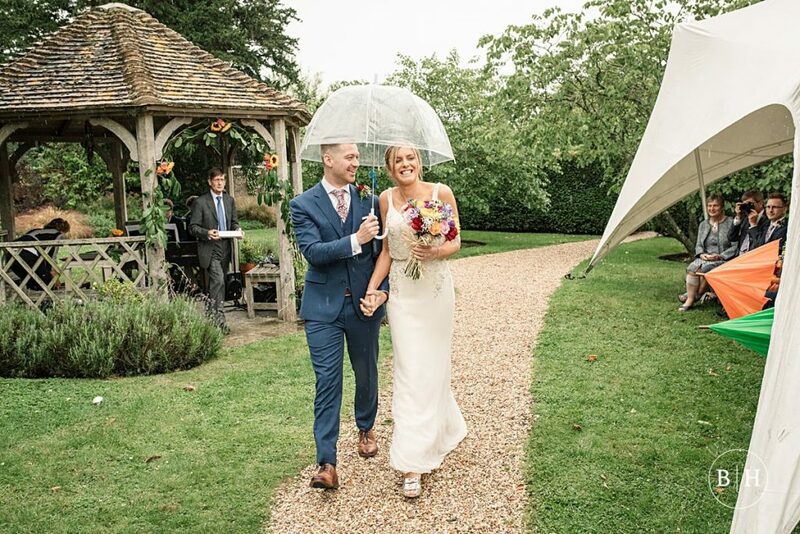 If you’re keeping your fingers crossed for the perfect outdoor ceremony, make sure that you’re happy with the venue’s alternative just in case of rain. Ask what the plan is if the heavens do open. Is there another room where the ceremony will be held? How do they handle a sudden change of plan if the weather looks bad? Will they consult with you before making the call on where to hold the ceremony? 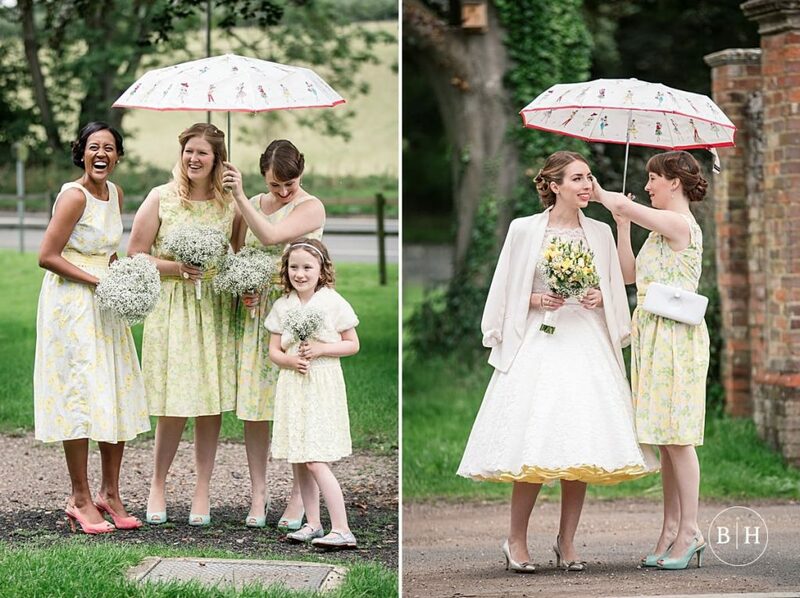 Make sure you talk with your hair and make up stylists about the best way to deal with a rainy day wedding. A professional hair or make up artist will have ways of ensuring that even in wet weather your look will be perfect all day long! I asked the lovely Kate from FlashKate Bridal Make Up who gave me a couple of top tips for make up. Aside from the obvious waterproof mascara and eyeliner (a must for even the sunniest wedding – weddings are emotional!) Kate says that opting for airbrushing is a great idea. It’s a silicone based foundation, so will withstand rain. Kate also fixes everything with a make up setting spray whatever the weather, because you can never be to careful with the English weather! 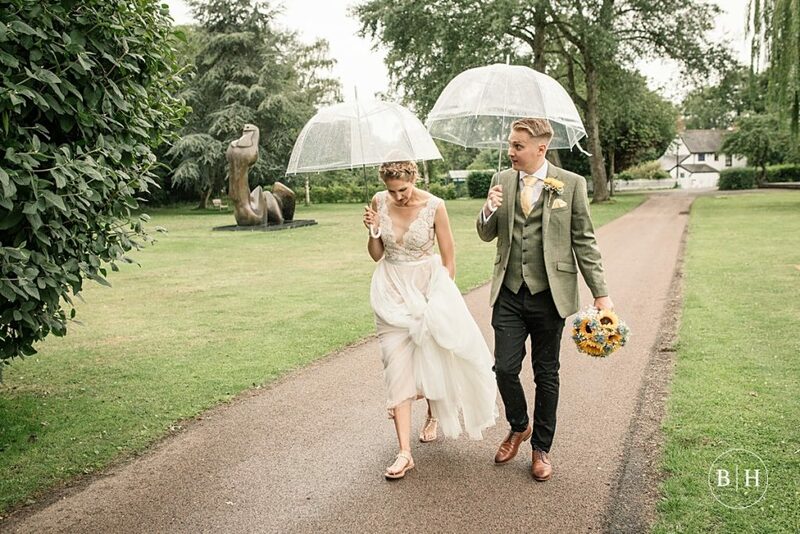 You’ve spent ages picking the perfect wedding dress to make you feel like a million dollars on your big day, so the last thing you’ll want to do is drag it through muddy puddles! I will never ask anyone to do this if they’re unhappy to do so. The last thing I want to do is to ruin your dress! But it’s always great if a couple are happy to get out in a bit of rain, even if it means their outfits getting a little damp. Remember, you’re only going to wear this dress once, so weigh up what’s more important to you – having awesome photos, or a perfect dress at the end of the day! If you have your heart set on a gorgeous vintage convertible to take you from A to B on your big day, make sure you have an alternative plan in case of bad weather. 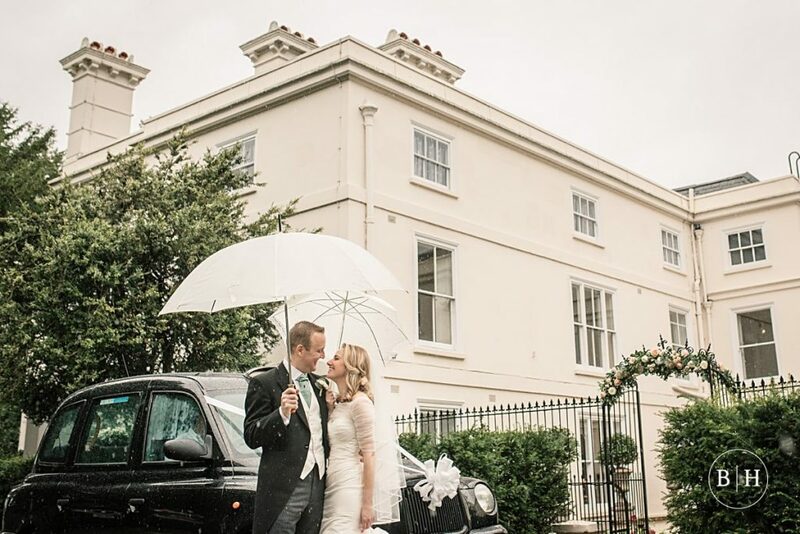 Also, many wedding transport companies will keep umbrellas in the back of the car in case of rain, but they might not be the prettiest! 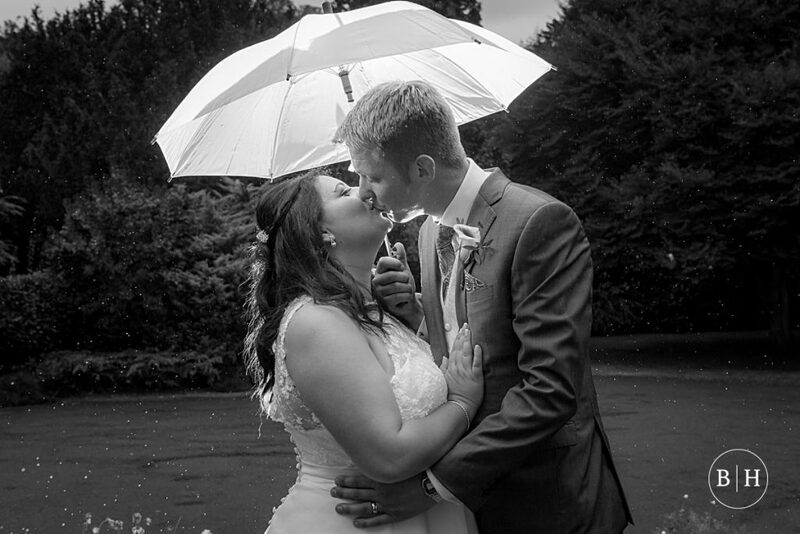 I actually really like an intimate couples portrait session in the rain! 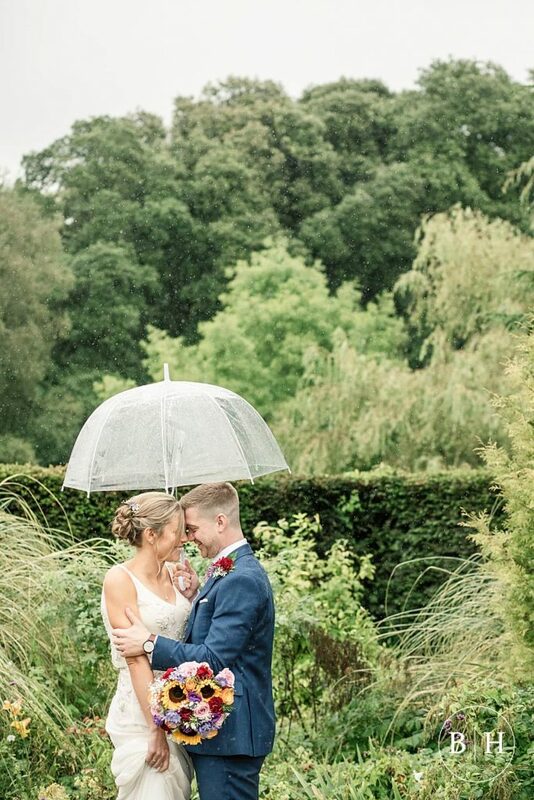 There’s something really special about having photos all cuddled up under an umbrella together! If you’re happy to go out in the rain, then that’s great, and we can get some awesome shots of you together. Usually there are a couple of periods of time on the day that lend themselves to short breaks for couples photos, but I’ll always keep an eye on the weather to see what it’s up to. I may grab you at a different time to what we’ve initially planned if there’s a break in the rain. I do always have a big white brolly in the back of my car too, just in case! 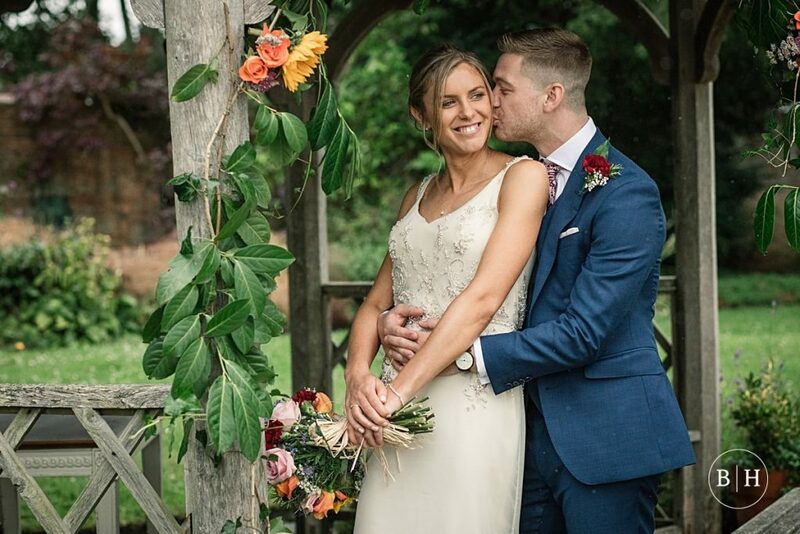 Some venues also really lend themselves to gorgeous photos indoors, so often we’ll do some indoor portraits too, or photos under the cover of pergolas or verandas. 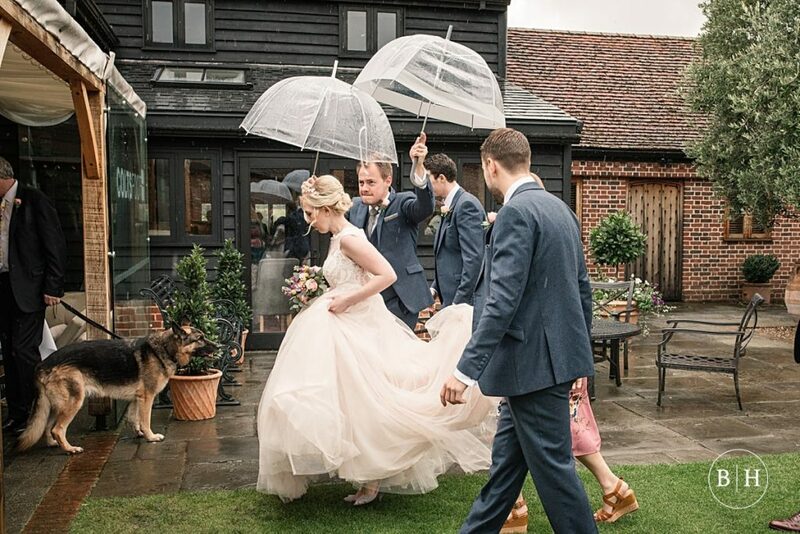 Generally I find this to be the most challenging aspect of a rainy wedding day – it can be tricky enough to organise a wedding full of champagne fuelled guests on a sunny day, but in bad weather, getting people to where they need to be can be a challenge! Often the best time of day for a large group photo is straight after the ceremony and confetti throw whilst everyone is in one place, so if it’s raining at this time, you may have to forego this shot if the indoor space doesn’t lend itself to fitting all your guests in for this photograph. 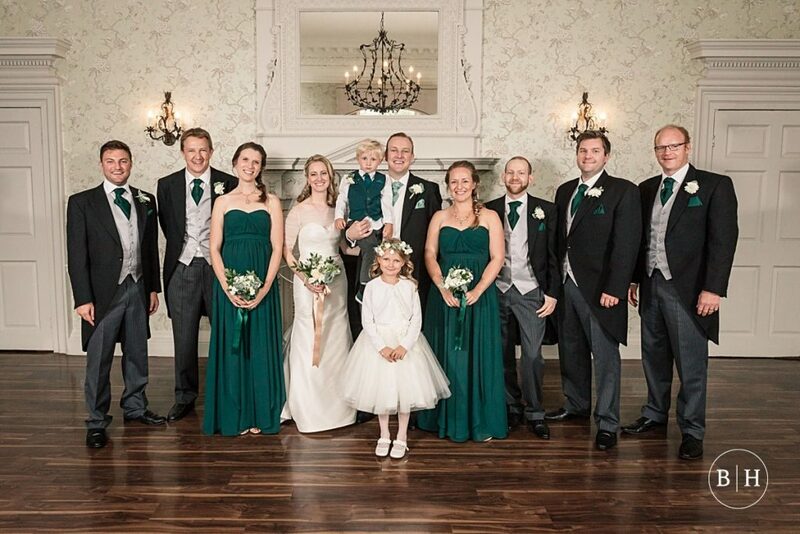 I always bring a lighting set up for the formal group photographs that can be set up quickly indoors should the weather outside be bad, so you won’t miss out on these important photos! 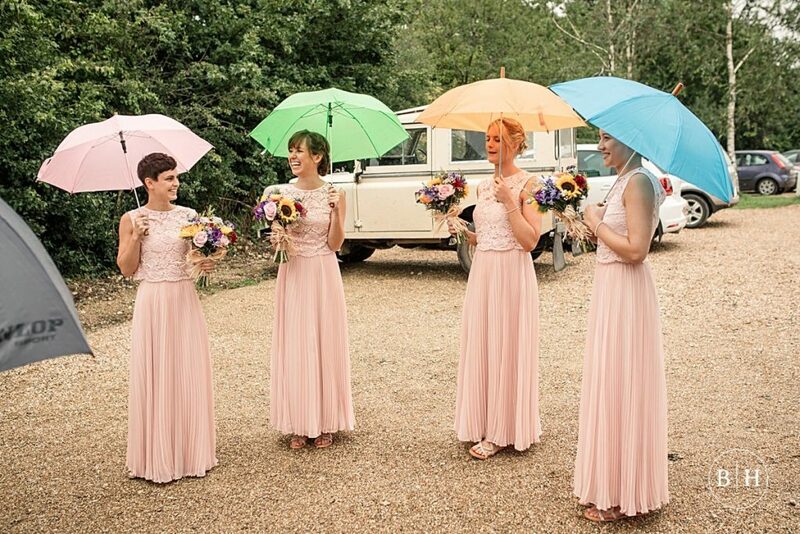 Whether it’s colourful brollies for your bridesmaids, or wellies to change into to let you splash in muddy puddles, accessorizing is a great idea to help you make the most of the weather even if there’s a downpour! If it looks like the weather is taking a turn for the worse, you can accessorize with a gorgeous wrap or blanket to keep you warm (you can find really nice ones cheaply at the last minute in high street shops). If you bulk buy wraps or umbrellas in case of rain, you can always keep your receipts and return them if you don’t end up using them! My final and most important tip for a rainy wedding day, is to try as much as possible not to worry or stress about it! There are some things in life you have no control over, and the weather is one of them. What will be will be, and you’ll drive yourself crazy if you spend the two weeks before your big day frantically checking the weather forecast. If it rains, then it rains, and there’s nothing you can do about it. The absolute best thing to do is to relax, enjoy your day and not let a bit of bad weather spoil your wedding day. Your guests will take their cue from you on the day, and if you’re happy and not worried about the weather, then nobody else will be phased by it either! 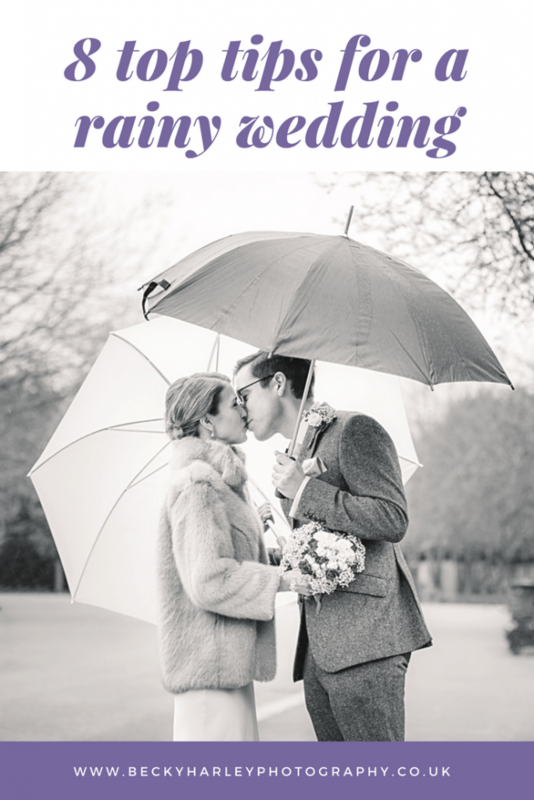 Hopefully you’ve found this article on top tips for a rainy wedding day helpful! If you’d like to chat wedding photography, or for any advice on weddings in general, please don’t hesitate to drop me a line!